Oh Hello everyone, I have a floral card to share with your today. My Sunday is cold, windy with hailstorms. The best thing to do was to watercolour a beautiful image. 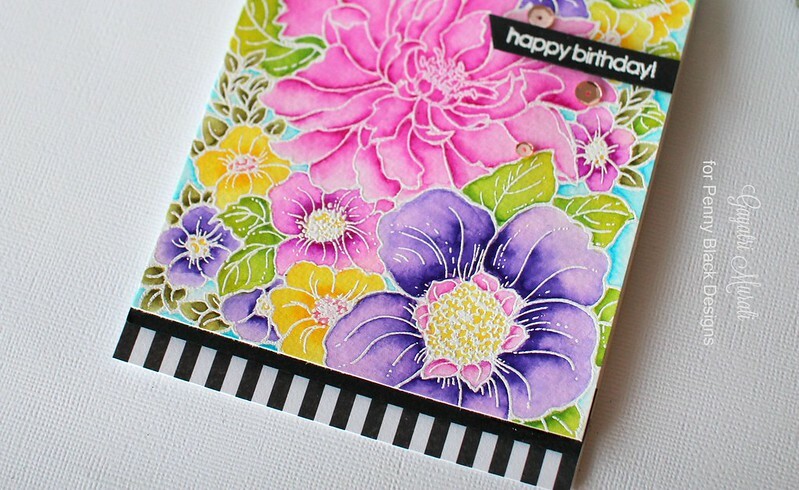 I love another of the new cling background stamp called Sweet Perfume. It is a beautiful cluster of flowers and leaves. Perfect image to watercolour. 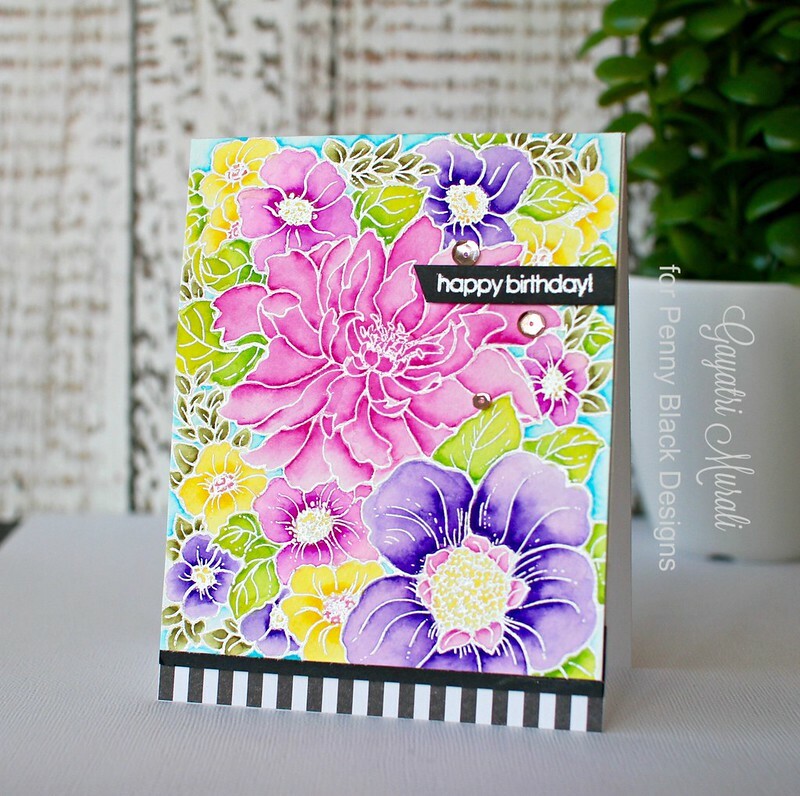 Here is the background cling stamp called Sweet Perfume from Penny Black. I white heat embossed this image on watercoloured paper and coloured the image with Zig clean Brush watercolour pens. At first, I laid a very light colour wash on the all of the images. While the paper is damp, I added shading with the darker shades of colour and blended the colour using aqua brush. It took me about an hour and half to finish watercolour with breaks in between. I then coloured the background with blue. Here are some closeups. I then trimmed the panel to 4″x5″. I added the black and white stripped pattern paper from Beau Jardins paper pack also from Penny Black on the bottom of the card base. I then added a strip of black cardstock on the bottom of the floral panel and adhered the panel on the card front using foam adhesive. The sentiment from Happy Notes stamp set is white heat embossed on black cardstock and adhered on the card front. Embellished with rose gold sequins. 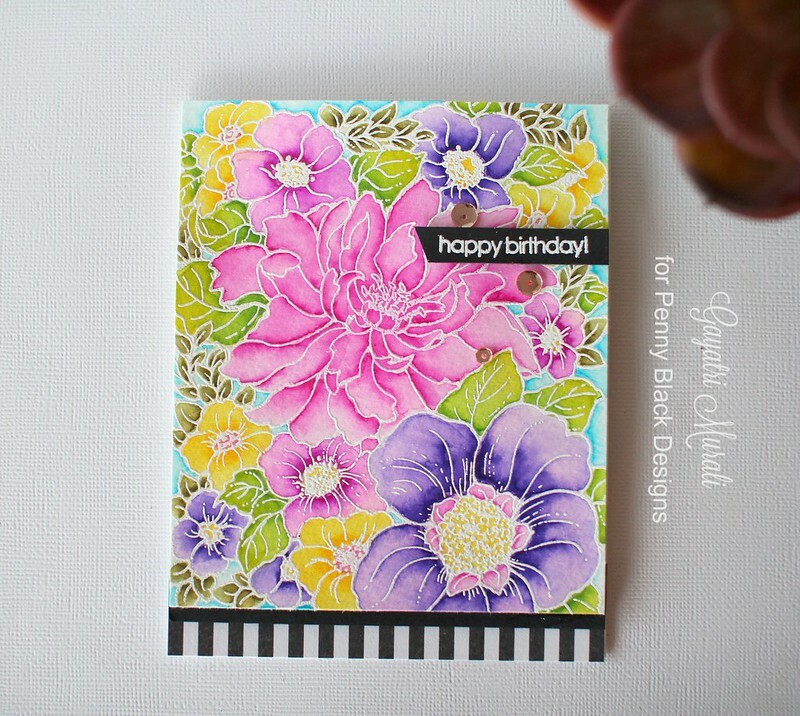 All the products from Penny Black I have used to make my card are available for purchase from Penny Black store. Thanks for stopping by my blog today! Have a wonderful day! Absolutely gorgeous!! The bottom panel just adds the perfect touch!! Love this stamp. Love how you used it Gayatri. Gorgeous coloring. 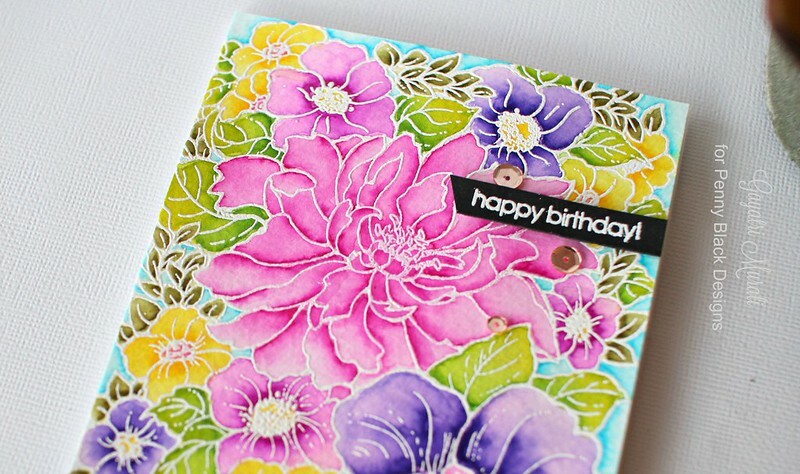 I just love this bold and beautiful card!! Your coloring is flawless and the touch of black and white stripes at the bottom is brilliant! : ) WOW! very pretty Gayatri. You are so talented.